Welcome to Sterling Environmental Air Duct Cleaning. We are readily available to provide commercial and residential property owners across the Southeast area of Michigan with air duct and dryer vent cleaning services. We are fully licensed and insured to provide our professional expertise and services to the community at an affordable cost. License# 71-11907. SE Michigan’s Most Experienced Air Duct Cleaner Working on Every Job! Sterling Environmental Air Duct Cleaning technicians are well trained, experienced, and skilled and exclusively utilize high-end equipment and products to ensure maximum results. In fact, Sterling Environmental Air Duct Cleaning has the most experienced air duct cleaning owner/operator in all of Southeast Michigan who performs every job! David Felker owns and operates Sterling Environmental Air Duct Cleaning and if you choose us to clean the air ducts in your home or business, there is 100% chance the owner will be doing the work for you! We are not a faraway franchise, we live and work in SE Michigan and are personally invested in your satisfaction. 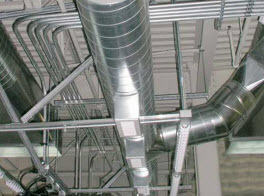 It’s imperative to clean all the components of the air duct system including ducts, vents, returns, registers, diffusers, grills, coils, fan motor and housing, heat exchangers and furnace to achieve optimal results. If you hire the wrong company and one component is neglected, it can contaminate the others within minutes. At Sterling Environmental Air Duct Cleaning, we do it right the first time. Our customers are our priority and we excel at customer service, traditional values, and superior workmanship. Contact us to schedule your next air duct or dryer vent cleaning today! At Sterling Environmental Air Duct Cleaning, we understand that the indoor air quality in your Southeast Michigan home or business is important to the health of all present. The U.S. Environmental Protection Agency (EPA) has listed poor indoor air quality as America’s fourth-largest environmental threat! 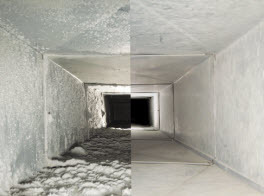 With our commitment and dedication to ensure the air ducts and dryer vents are clean to perfection whenever you request our services, you can rest assured that the service is completed to perfection in an effort to improve your indoor air quality in cities such as Southfield, Warren, St Clair Shores, Sterling Heights, Clinton Township and Greater Detroit, Michigan. 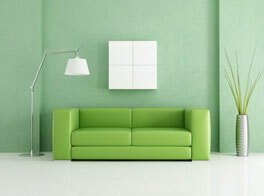 We Remove Dust & Contaminants from the Air You Breathe in Greater Warren, MI! 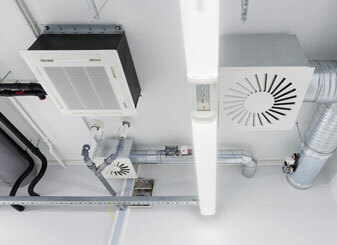 Air duct cleaning is one of the most important things to have done to improve your indoor air quality. Contaminants and pollutants that make their way into your air conditioning’s ducts are produced by everyday living, from you, family members, and especially your pets. How Often Should I Get My Air Ducts Cleaned in Greater Sterling Heights, MI? These impurities that are caught in the air ducts are constantly being re-circulated 5-7 times a day are these particulates consistently assault air respiratory system. Additionally, the filth and grime will accumulate inside the ducts, becoming more potent in the air that you breathe. 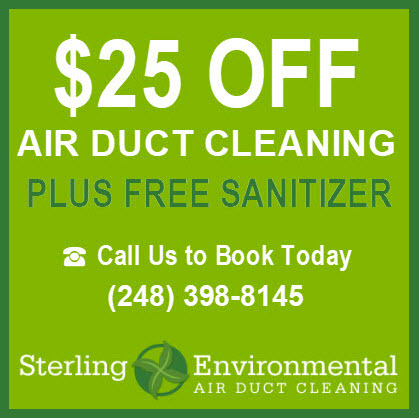 In an effort to control the buildup and keep your air quality pure, a professional cleaning every 5-7 years is recommended by Sterling Environmental Air Duct Cleaning for your Southeast Michigan home or business and more often if smokers, pets, allergy sufferers etc are present in the home. Homes and businesses of the Southeast Michigan area that have dryers can significantly benefit from a dryer vent cleaning from Sterling Environmental Air Duct Cleaning. Safety is the number one concern in regards to your dryer vents. 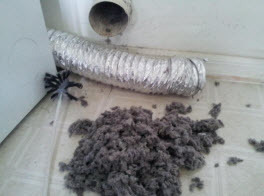 Lint filters through the dryer vent system, which is more of a hazard than you realize. Clogged dryer vents not only hinders the dryer’s efficiency, causing you to have to run the cycle multiply times to dry an average load, but it is also the perfect kindling for fires that might ignite from the heat dryer appliance or an electrical spark. Ensuring they are professional cleaned by Sterling Environmental Air Duct Cleaning experts once a year and two times a year for larger families can significantly reduce the risk of fires and keeps the dryer operating at peak performance. For your Southeast Michigan commercial and residential air duct and dryer vent cleaning services, contact Sterling Environmental Air Duct Cleaning and let our experts do the rest.